Clark Little was born in Napa, California in 1968. Two years later, a move to the North Shore of Oahu (Hawaii) dramatically changed his future. In the 80’s and 90’s he made his name as a pioneer of surfing at the Waimea Bay shorebreak. Clark had a unique talent for taking off on hopeless closeout shorebreak waves and surviving in one piece. 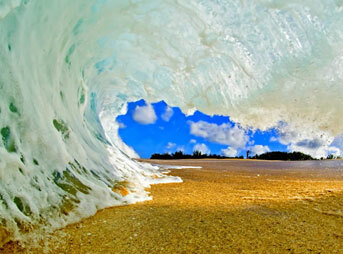 In 2007, Clark discovered his ability and passion to capture the extraordinary beauty of the shorebreak when his wife asked him for a picture of the ocean to decorate a bedroom wall. With the confidence of an experienced surfer, Clark jumped in the ocean, and started snapping away, recording the beauty and power of Hawaiian waves. In just 5 years, Clark has gained worldwide recognition for his North Shore shorebreak wave photography with appearances on television shows including Good Morning America, Inside Edition, The Today Show, and ABC World News Now.